Life can be up one minute and down the next creating a myriad of emotions. 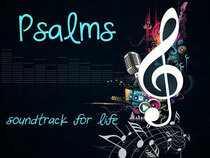 There’s an ancient soundtrack for life called "Psalms" and though it was released thousands of years ago, it’s still relevant to today’s culture. People today still resonate with each track and are inspired by its messages of hope. So grab your ear buds and hit play. This is "Psalms." October 27 - "Fright Night"
Fear is a natural reaction to some situations, but we can find peace by calling out to God, surrendering to Him what we cannot control, and choosing to walk in faith. November 3 - "When Everything Goes Dark"
Learning to push through depressing times. The Psalms show us how we can find hope even in the darkest times. When depression sets in, we must look to God for hope, seek community, and look to Him for an eternal perspective. We’ll look at ways to rejoice in every area of life, because joy stems from knowing what God has done in our past, His plan for our present, and His power over our future. God doesn’t expect us to pretend our vengeance isn’t real. He does expect us to resist the temptation to return evil for evil, to work for reconciliation, and to overcome evil with good. November 24 - "The Attitude of Gratitude"
No matter what our circumstances, we can, and should, live a thankful life. This can happen when we’re convinced of God’s love for us in creation, through our salvation history, and through His current provision for us. December 8 - "Every Breath"
We should praise God no matter what we are going through. So long as we have breath, praise God for who He is and what He does, in any and every possible way.